The villagers reacted to the Council’s invitation as if it were a smile. Slowly, it deepens and broadens and reveals a row of iron teeth.’Have you ever heard of the Ingrians? They are a people, related to the Finns, who resided in the Soviet Union. They were massacred in a series of events that could, and even ought to be, called a genocide. The life of Aamu Lambsdaughter and her family, originally from a little village called Clam by the Gulf of Finland, is composed of incredible events and tragic adventures. After getting deported to the cruel arctic wilderness in Siberia, the young Aamu is abducted to become a concubine to a Samoyed clan chef. She manages to escape and reunite with her childhood friend and lover. They walk the thousands of kilometers back to Clam – only to live for years in hiding, in a vast, pitch-dark grave. Perhaps the luck has turned, when their tribal brothers in Finland welcome the Ingrians to return “home” during the Second World War. But the course of history has other plans for them. A family epic with multiple narrators, the skillfully orchestrated novel The Matriarch sometimes reaches the heights of surrealism. 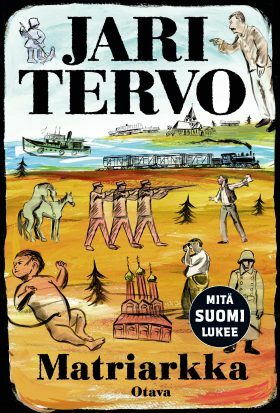 This is Tervo’s first novel with Otava Publishing Company. It is a ferocious, lush and ingenious family saga that combines historic events with current international themes like minority repression, refugees, human rights, and the role of Russia today. Tervo’s language and storytelling flow more daringly and prolifically than ever.